This is finally the year you are going to get on the slopes and learn how to snowboard! While learning how to board is in itself an exciting and painful experience, finding the right snowboard can be equally as challenging. Buying your first snowboard may seem like a daunting task, but you just have to remember a few basics to make the experience easier. Decide on your price range. You really don’t need an $800 snowboard if you’re going to be spending most of your time on the bunny slopes. You’ll probably beat up your first board anyway. Try to get a board that is $300 or less. If you can get a package deal and buy the board, bindings, and boots all together, even better. You can also save money by buying a second hand board. Don’t spend your whole budget on just the board because you also need boots, bindings, goggles, a helmet, and board pants and a jacket. Find the right size. If you’re buying a board in the store, you can determine the right size by how tall it is. Set one edge on the floor and stand behind it. You want a board that comes to your chin, give or take a few inches. If you’re ordering online, you have to look at the measurements of the board. Choose a board that is 15 to 20 centimeters shorter than you are. So if you’re 5 foot and 7 inches tall, that means you are 170 centimeters tall. A board that is 150 to 155 centimeters in length will work well for you. Keep in mind that if you choose a board on the shorter side, it will be easier to handle while learning. What type of board should you get? Ladies, the women’s boards will be better suited to your needs. Generally, they are made to handle lower centers of gravity, smaller feet, and less weight. For beginners, an all mountain board (also known as freeride) will work well. All mountain just means that the snowboard can handle any terrain you would like to try, but it doesn’t specialize in any specific type. You can take it on groomed trails, powder runs, the terrain park, jumps, and pretty much anything else. Don’t forget about the boots and bindings. You can’t use your snowboard without them. The boots should fit snuggly without being painful. You should be able to wiggle your toes, but ankle movement will be restricted (it prevents injuries). There will be two parts, the boot and the liner. They typically get laced up separately. It will be a little difficult to get your foot in the boot. That’s normal! Once again, a snug boot helps prevent injuries. Buy your snowboard bindings to fit your boots. Most bindings have two straps, one over your toes and one over your ankles. They will also have a base plate, which is the part that you attach to the board. There will also be a highback, which is the part that rests against the back of your boot and secures your heels and calves. Once you’ve got that new first snowboard, take care of it! You’ll need a rack for your car to transport it to and from the mountain. 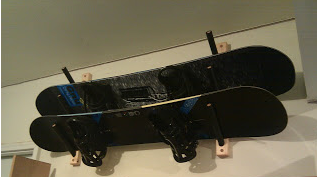 Then, when you’re at the mountain, check out the board bumper to protect your board and car while you’re gearing up. 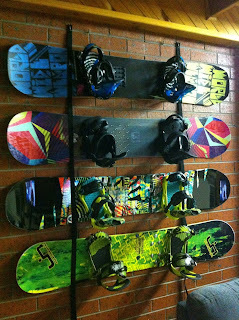 Of course, don’t forget a snowboard rack to store and display your board at home.